A MAGNITUDE 4.4 earthquake has struck Southern California, just a few miles east of Los Angeles, with reports of buildings shaking. According to USGC the quake was centred about three miles north of the small city of La Verne, in the San Gabriel Valley. The epicentre is located about 25 miles east of downtown Los Angeles. USGC said the shake was followed by another 3.4 magnitude temblor. Former California state assemblyman Mike Gatto wrote on Twitter: "Pretty sure that was an earthquake in Los Angeles. "Strong enough that it swayed the floor." 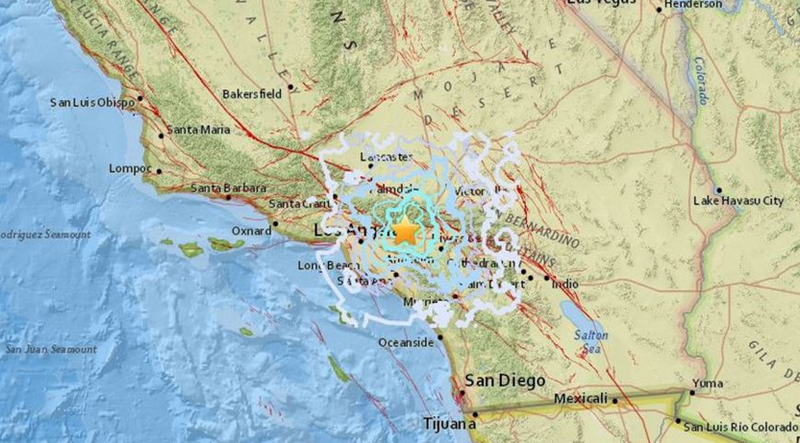 Reports suggest the shake was felt throughout the Los Angeles County, Orange County and Inland Empire areas. There are no immediate reports of damage or injuries, but people claimed it shook buildings for several seconds in downtown Los Angeles. This is not the first earthquake that has struck southern California this month, as two earthquakes hit the region within the space of 30 on August 15. The bigger of the two, registering at magnitude 4.4, was felt as much as 50km away in Los Angeles. Seismologists believe the unsettling of the Ring of Fire, the largest and most active fault line in the world, could lead to a catastrophic earthquake somewhere around the globe, and California has been touted as a possible destination. Richard Aster, Professor of Geophysics at Colorado State University wrote recently for the Conversation: “The earthquake situation in California is actually more dire than people who aren't seismologists like myself may realise. The last time there was a magnitude seven quake or higher in California was in 1906, which struck San Francisco and ultimately killed around 3,000 people. But Professor Aster says the damage this time could be much worse.